Are you looking for a supercar? Do you want something exclusive, gorgeous, and exotic? Then Apex Motorworks can help you out in the Chicago area. In fact, we routinely have Lamborghini models in our inventory. See for yourself and try a used Lamborghini in Chicago, IL at Apex Motorworks today. We are located just outside of the downtown area in the suburb of Burr Ridge, and we can’t wait to help you out. Lamborghini makes a lot of models including the Huracan, the Aventador, and the Urus. Lamborghini also has a long history for making mouth-watering cars, and no matter what you are looking for from Lamborghini, Apex Motorworks can help you find it. We routinely have fresh Lamborghini models in stock, and you can click the link below to see our Lamborghini inventory right now. You can also keep reading to learn more about us. 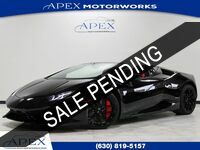 Why buy a used Lamborghini at Apex Motorworks? At Apex Motorworks, we know luxury and we know performance. Though we may not always have a Lamborghini in stock, our inventory is frequently host to the most high-line brands on the market including Ferrari, Rolls-Royce, Porsche, AMG, and even specific halo cars like the Challenger Hellcat, Nissan GT-R, and more. When it comes to Lamborghini, our team knows what we are talking about. If we don’t have the Lamborghini model that you want in our inventory, then you have nothing to worry about. Our team is comprised of acquisition experts, and even if we don’t have the specific vehicle you are looking for, we can leverage our dealership network connections to locate a pristine Lamborghini example that meets all of your specifications and desires. Let us find you the car of your dreams today. If you want to learn more about a specific model in our inventory, whether it be a Lamborghini or something else, or if you would like us to get to work looking for your dream car, then you can feel free to reach out to us right now using the link that we have below. We look forward to hearing from you soon and we can’t wait to help you with whatever you may need. Interested in a Used Lamborghini?